A 88 -year-old Briton was Sunday for the first time on stage in a ballet show after he first started until his 79th to ballet. John Lowe from Witchford, north of London, began ballet after he saw become his daughter a professional dancer. He went to the local dance school and asked if he could learn to tap dance and do ballet. "No problem, they said there, and since then I keep dancing," says Lowe. At age 88 a man can ever have physical discomfort, but Lowe has a solution. "Home I use a rope to lift my leg, but for the rest I have no problems just because I practice as often. " "And there is nothing effeminate in ballet," Lowe refutes the criticism. "You should just be in incredibly condition to do ballet. I see sickly people walk down the street with a cigarette in their mouth. They would go better to ballet. 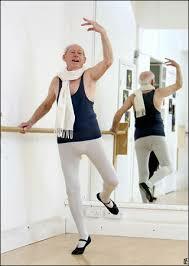 Ballet is great fun and I do not understand why not more people do it."